"I will say it straight out, if you smuggle and slaughter cows, then you will be killed. The cow is our mother," the BJP MLA from Alwar said. 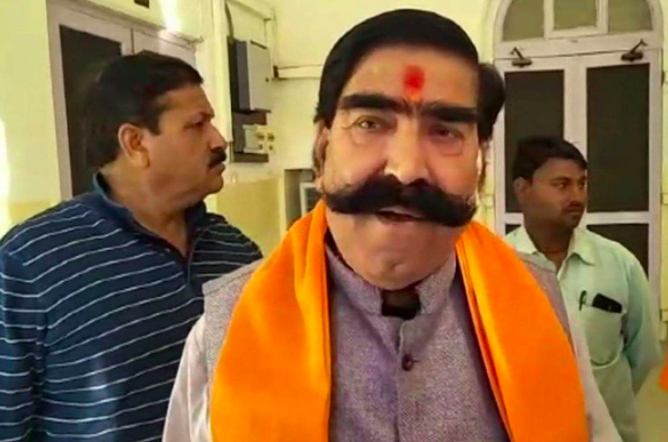 New Delhi: Gyan Dev Ahuja, BJP MLA from Alwar, Rajasthan, has reportedly said that if someone engages in cow smuggling or slaughters a cow, he will be killed. “Mera toh seedha seedha kehna hai ki gautaskari aur gaukashi karoge to yu hi maroge (I will say it straight out, if you smuggle and slaughter cows, then you will be killed). The cow is our mother,” Indian Express quoted Ahuja as saying. Ahuja was reacting to a man named Zakir who was allegedly beaten badly by a mob in Alwar district because they thought he was a cow smuggler. Zakir was later arrested on Saturday. The BJP MLA refuted allegations of mob violence. “As the public was following the truck, it overturned, resulting in the injuries… Now he is saying that villagers beat him up. I have taken details of the case from the SHO. The people didn’t beat him. He was injured because the vehicle overturned,” the newspaper quoted him as saying. According to IndiaSpend‘s database on cow-related hate crimes, which contains data for the last eight years, the number of such crimes was highest in 2017. Eleven people died in such crimes and of those killed, 86% were Muslim. The MLA did not then explain how he had known what was in the garbage on the university campus.